On June 6th 1944 during World War 2 allied forces suffered extensive and devastating losses. Now referred to as D-Day, the Normandy landings, codename Operation Neptune, took place. 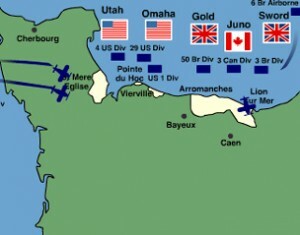 The objective of the landings was to successfully carry out the Allied invasion of Normandy. Commencing on Tuesday, 6th June 1944 (D-Day) at 6:30am British Double Summer Time (GMT+2), the Normandy landings were implemented in two phases; an airborne assault landing that consisted of 24,000 British, American, Canadian and Free French airborne troops beginning shortly after midnight and an amphibious landing of Allied armoured divisions and infantry on the coast of France starting at 6:30am. Running parallel to the operation were two further endeavours; the codenames of which were Operation Glimmer and Operation Taxable; both of which were intended to distract German forces from the actual landing areas. Under the command of General Dwight Eisenhower (Supreme Commander of the Allied expeditionary forces) and General Bernard Montgomery (overall commander of ground forces), the D-Day landings were planned to be the largest ever amphibious invasion in world history. In total an estimated 160,000 troops landed on June 6 1944 and over 5,000 ships were involved in the operation. The invasion commenced with the transportation of soldiers and artillery from the United Kingdom via ships and aircraft to the intended location of the Normandy coast; a 50-mile stretch of coast that was divided into five sectors: Utah, Omaha, Gold, Juno. However, after landing upon the beaches of Normandy, Allied troops found themselves being fired upon from all angles, with the result of widespread loss of life. However, undeterred, the troops pushed on with their objective; to commence into France and lead the mission to overthrow Nazi Germany and its leader Adolf Hitler. After several years of fighting, the Nazis had gained control of much of Europe and the events that unfolded on June 6 1944 shaped the eventual outcome of World War 2. Allied forces had already lost an estimated 12,000 men and over 2,000 aircraft in operations during April and May 1944, which lead up to D-Day. After landing at Normandy, the troops were to endure a further eleven months of fierce fighting, resulting in an estimated casualty figure of 10,000, including 2500 dead. The losses were devastating, but by embarking on the mission, Allied troops fought their way to the German capital of Berlin and to the bunker that Adolf Hitler used as his headquarters. Had the horrific events of D-Day never happened, the outcome of World War 2 could have been very different indeed. In recent times, we remember the fallen soldiers of D-Day and the sacrifice that they made to ensure the freedom of generations to come. Today, 27 war cemeteries hold the remains of over 110,000 dead soldiers from both sides of the war. The figures in these cemeteries are estimated to be 77,866 German, 9386 American, 17,769 British, 5002 Canadian and 650 Poles. Additionally, between 15,000 and 20,000 French civilians were killed, mainly as an indirect result of the Allied bombings.